This post may contain affiliate links, by which I may be financially compensated. See Disclosures & Policies on my About page. Thanks to everyone who commented on the last fortune featured on Fortune Cookie Friday! I'm glad you're enjoying it! The pleasure of what we enjoy is lost by wanting more. Oh, this is a good one! This fortune, to me, speaks about living "in the now" instead of always looking for what is next, and to have gratitude for what we have or what we are doing. How many times have you missed out on something because you were too busy worrying about what was coming next? How many times have you gotten something you wanted (or thought you wanted), only to discover that it's not enough? How many times have we spent all week looking forward to Friday instead of enjoying the week for what it was? We tend to live in a very consumerist and "wanting" society: to buy more, that bigger is better, and that we have to have what the other guy has. I can enjoy life in the moment now, but I didn't used to. For instance, sometimes I would buy yarn, and then look for what other colorways I could get it in instead of just using the one I have. Or I could start a knitting project, and find myself looking on Ravelry for the next project instead of enjoying the one I'm on. I'm sure I could find plenty of examples of how I did this. This cookie reminds me to stop and enjoy what I'm doing, RIGHT NOW, instead of looking for the next thing. 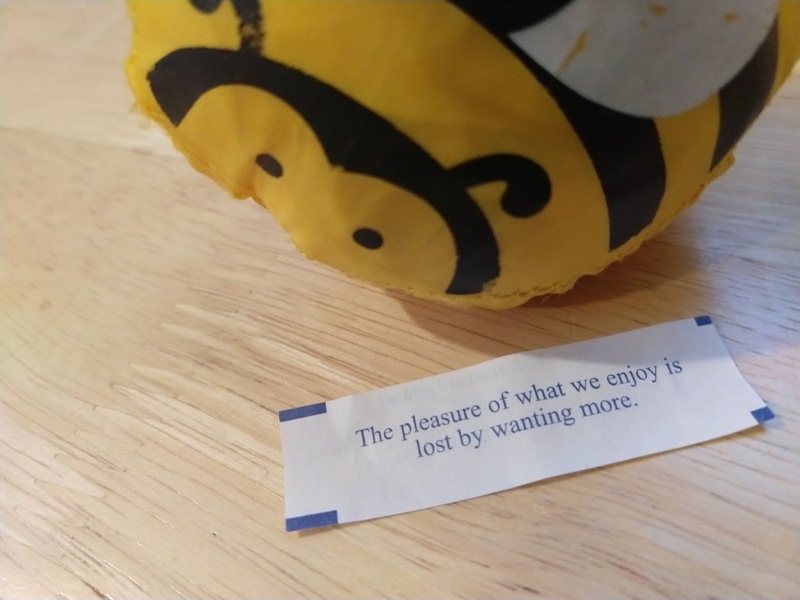 This cookie reminds me to enjoy what I have. I don't want life to pass me by because I was too busy wanting more. So, my question for you is: what are you going to do today that you will remember to enjoy, to savor, or be grateful for? And hey, if you get any fortune cookies, feel free to share them and let me know what they mean to you. You can get them at your local Chinese restaurant, typically, or you can order some here. Yes! So many times we miss out on the great things we have in front of us because of this! Thanks for sharing! I agree. I often see that wish for the weekend to come in my newsfeed. In my case, I usually don't notice that it's already the weekend because I am always busy. This is great! What a cool idea.